Soon fans will finally have a chance to see the Miles Morales version of Spider-Man, a black/Latino kid, in Sony's Spider-Man: Into the Spider-Verse (which is awesome, btw). Marvel found a ridiculous hit with Black Panther, while Wonder Woman was the DCEU's most successful film by far. In short, audiences are looking for more diversity out of their superheroes, and Warner Bros. is hoping to give them some with a movie on DC Comics hero, Blue Beetle. If you're thinking, "Hey, isn't Blue Beetle a white guy named Ted Kord"? Well, yeah, that was one version, often seen teaming up with Booster Gold. 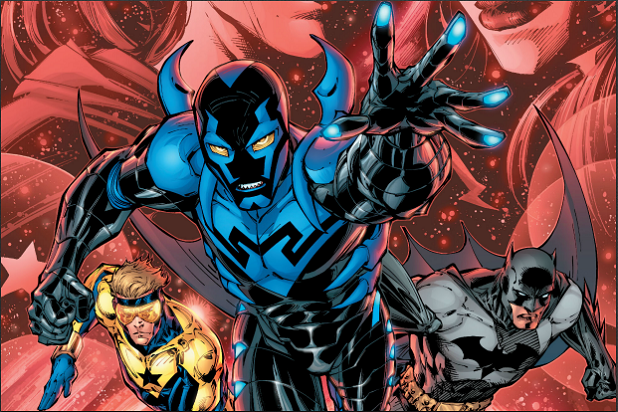 But the more recent version of Blue Beetle is a Latino man, Jaime Reyes, who took up the mantle from Kord during the events of 2006's Infinite Crisis storyline. Unlike Kord, who used his wealth to fund his crime-fighting activities, Reyes actually has superpowers, gifted to him by a magical scarab.